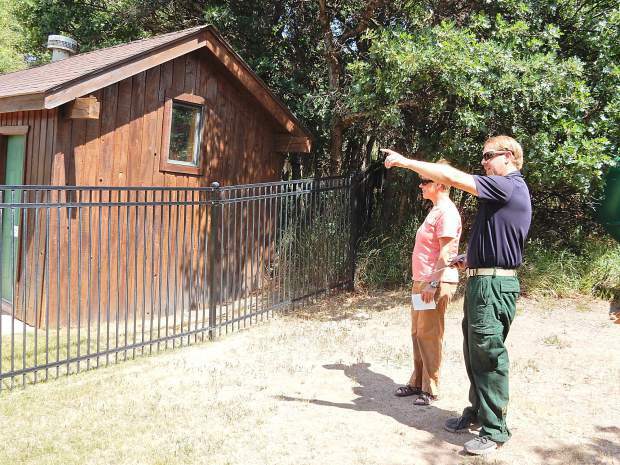 Eagle County Wildfire Mitigation Coordinator Eric Lovgren (right) points out work that needs to be done at the Aspen Mountain View subdivision community center to homeowners' association president Nancy Bobrow. Eagle County Wildfire Mitigation Coordinator Eric Lovgren, right, consults with Nancy Bobrow Julu 19 about mitigation of her property in Missouri Heights. The Lake Christine Fire burns in the background. 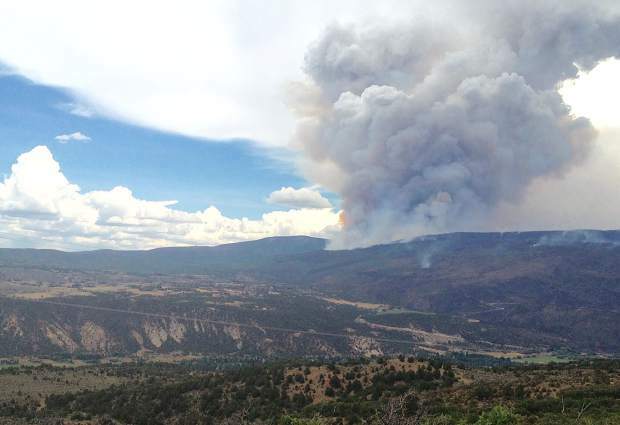 This picture of the Lake Christine Fire was taken from atop the Crown on Saturday. The Missouri Heights area to the left is generally considered in a moderate to high hazard zone for wildfires. 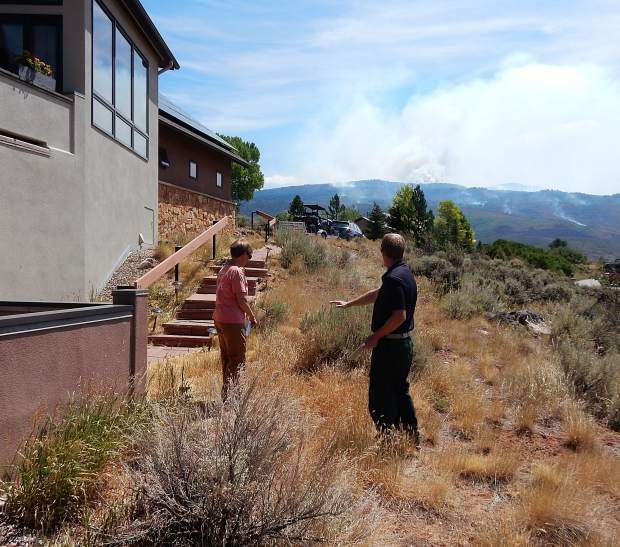 Eagle County Wildfire Mitigation Coordinator Eric Lovgren poined to this home in Missouri Heights as an example of how mitigation can help save a house. The fire burned to the edge of the lawn, which is watered and kept free of long, dead grasses. The trees approaching the property were spaced out and limbed. 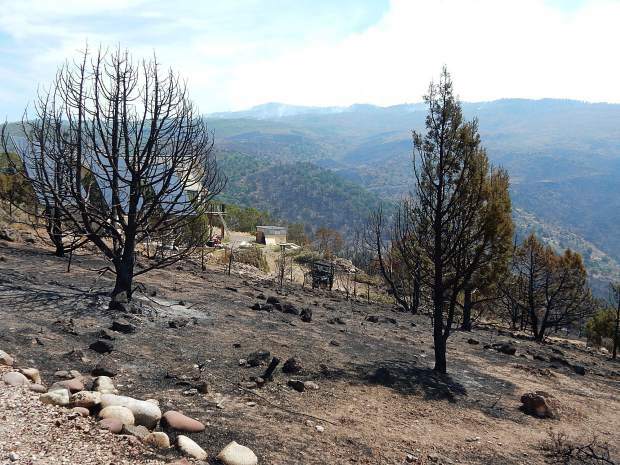 The spacing and removal of lower limbs on pinion and juniper trees in the Vista Hi neighborhood of Missouri Heights likely slowed the spread of the Lake Christine Fire on July 4-5. Eagle County government has put a significant effort into fighting the Lake Christine Fire so far, with no end in sight. The county estimated that 141 individual staff members from 28 offices and departments have put hours into the effort from the afternoon the fire broke out July 3 through July 18. The effort went right to the top. 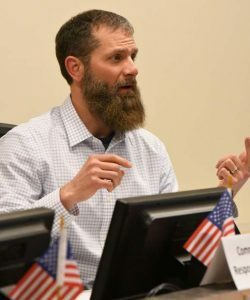 The three Eagle County commissioners have spent considerable time in the Roaring Fork Valley, particularly early in the incident when neighborhoods were threatened. Other efforts have ranged from wildfire mitigation assessments on properties to the GIS department helping prepare maps showing the locations of drainages susceptible to flash flooding. The figure doesn’t include the monumental effort undertaken by the sheriff’s office, which played a huge role in evacuating neighborhoods, patrolling while the fire danger was great and now monitoring roads in Missouri Heights and Fryingpan Valley to keep gawkers out. Sheriff James Van Beek said early in the incident that he had more than 20 officers and administrative personnel involved in the effort each shift. The county also handed over use of its office building in the Roaring Fork Valley as the first command post for the initial federal incident command team. The grounds of the office building and community center were used for everything from pitching tents where firefighters slept to news conferences by Colo. Gov. John Hickenlooper and other elected officials. No estimate was available on how much money Eagle County has spent to date on the firefighting effort. Eric Lovgren has became one of the most popular people in the Roaring Fork Valley this month. Eagle County Wildfire Mitigation Coordinator’s advice on how homeowners can shore up their property to make it less susceptible to wildfire is suddenly in high demand because of the Lake Christine Fire. There is no shortage of work for him. The vast majority of homes in the Roaring Fork Valley portion of Eagle County are in the wildland-urban interface — where forest land meets development — or the intermix area, where homes are surrounded by the woods. But by undertaking mitigation on homes and surrounding landscape, property owners can reduce their wildfire hazard. Eagle County has required owners of new construction or exterior remodels to comply with wildfire regulations for about the past 15 years. Lovgren examines properties to determine if they are in a low, moderate or high wildfire hazard area, then he comes up with the appropriate battle plan. Most land being developed these days has a high hazard rating. “The low hanging fruit is gone,” Lovgren said. He advises what steps must be taken to mitigate wildfire — the higher the hazard, the more the steps. Construction in the high hazard area, for example, requires use of non-combustible or fire resistive exterior materials. Certificates of occupancy aren’t issued until Lovgren deems properties compliant. The owners of structures built prior to the more stringent rules can voluntarily seek Lovgren’s advice. Participants in the Real Fire program get a certificate showing that they complied with the wildfire mitigation recommendations. Those certificates can be presented to insurers to try to get a lower premium price. Lovgren scanned the Lake Christine Fire burn area from Missouri Heights last week to assess the effectiveness of mitigation efforts. “You see an evident difference where mitigation took place,” he said while on a tour of El Jebel and the east side of Missouri Heights one recent afternoon. He pointed to mitigation projects big and small. On the lower slopes of Basalt Mountain there was a prescribed burn earlier this decade and mechanical removal of some of the thick, decadent vegetation. 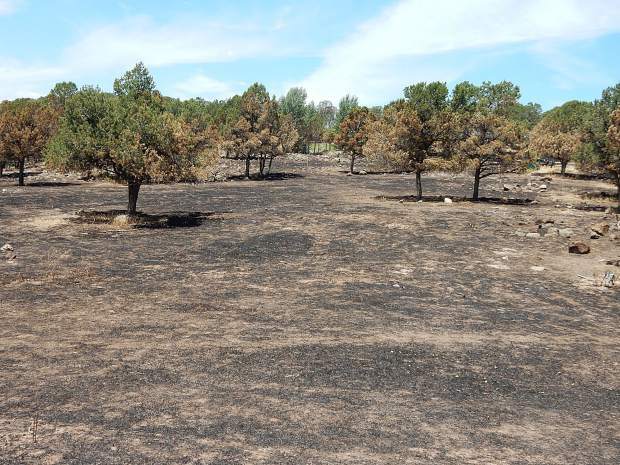 The significant patch of ground was largely left alone by the Lake Christine Fire. The wildfire burned right next to it but couldn’t advance through it. In the valley floor, vegetation was removed in 2004-05 undertaken by the U.S. Forest Service and Bureau of Land Management on federal lands adjacent to the El Jebel Mobile Home Park. 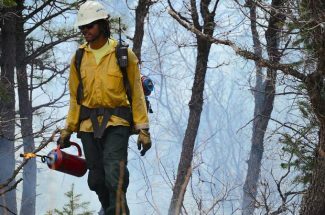 That work may have played a role in slowing the fire as it raged down the ridge July 4, giving the firefighters a better chance to make a stand, Lovgren said. In the Blue Creek Overlook neighborhood of lower Missouri Heights, Lovgren showed how the fire burned right to the property line of a few homes but didn’t encroach on the islands of green, watered lawns. The homes there are deemed in high hazard but they undertook appropriate mitigation, Lovgren said. He focuses on landscaping within 200 feet of a structure, which he calls the “home ignition zone.” The area doesn’t have to be denuded of vegetation, as many people fear, he said. The pinion and juniper trees outside the lawn were spaced out so they weren’t touching and the lower limbs had been removed to lessen the chance of fire on the ground climbing up. “When it’s done correctly it’s super effective,” Lovgren said. Tall, dead grasses were removed from the fences. Pebbles were used for landscaping rather than bark or cedar chips. Lovgren recommends getting rid of cedar shake roofs and using fire resistant exterior materials in high hazard areas. It’s important that eaves don’t have gaps where a spark can enter and lead to fire. Metal flashing is recommended at ground level so flames can’t snake up behind stucco or paneling. One recent day he met with Nancy Bobrow, president of the Aspen Mountain View subdivision’s homeowners’ association, to advise how their pool area and community center could be more fire wise. That was a particularly active day for the Lake Christine Fire, so a column of smoke was rising high into the atmosphere to the east while Lovgren conferred with Bobrow. Eventually a medium-sized tanker started dropping retardant on thick timber a couple of miles away. Lovgren advised Bobrow to have oak branches overhanging the pool house cut back and “the little stuff that acts as kindling” cleaned up. That includes leaf litter, grass and dead twigs and branches. A tennis court acts as a good firebreak but the water pump building has too much tall grass too close. It should be mowed 30 feet out to a height of six inches, according to Lovgren. Bobrow said there are 78 homes in Aspen Mountain View with eight undeveloped lots. She is urging homeowners who built before Eagle County implemented its Real Fire program to get an assessment from Lovgren or the Basalt Fire Department and take the steps to improve their property. The Lake Christine Fire, so visible to homeowners in the subdivision, will likely produce momentum to take steps. “It’s the old come-to-Jesus-moment,” Bobrow said. Lovgren said Sopris Village subdivision and part of Willits are among the few areas of Eagle County in the Roaring Fork Valley that have a low hazard of wildfire. Most of the area has a moderate hazard and some of it high. “You could have fire in Basalt right down to Midland Avenue,” he noted. 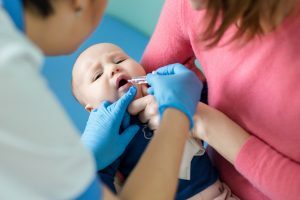 To make an appointment to consult with Lovgren, he can be reached at eric.lovgren@eaglecounty.us or 970-328-8742. Property owners can also contact their local fire department for an assessment.